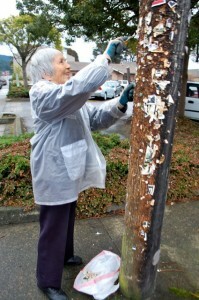 ARCATA – Something many Arcatans probably consider part of their daily cultural life is the utility pole flyers advertising shows, events, causes, yard sales, anti-medical marijuana conspiracies, lost kittens or random abstract whimsy. But to others, they’re just ugly, and mostly wind up as litter. The real problem is that flyers are usually not legal, according to state law. Who cares? Apparently some Arcata residents do, according to APD Lt. Ryan Peterson. “We’ve received complaints from the public, that they look terrible,” he said. Another problem is that few to no flyer-posters come back and remove the notices once the advertised event has taken place, so the flyers are blown off the poles by weather, end up on the ground as litter or flushed into the storm drains. To abate the problem, APD is contacting event promoters by letter and via personal contacts, and having members of its Citizen Volunteer Patrol Program take them down. While Arcata-based flyer-posters are generally cooperative, Peterson said Eureka clubs like the Red Fox Tavern and Nocturnum have been resistant to reform. “They don’t have a lot of buy-in,” he said. He noted that many stores offer legal flyer-posting space and that there are also public bulletin boards available for them. In the course of analyzing the flyers, APD has learned of events that weren’t properly permitted, having bypassed safety signoffs from the City, the Fire Department and APD. This entry was posted on Wednesday, December 1st, 2010 at 5:21 am	and is filed under News, Community. You can follow any responses to this entry through the RSS 2.0 feed.